This hundredth issue of the Broken Rifle reprints articles that relate to the strategies affiliates of WRI are using and and issues they are dealing with. There are articles on direct nonviolent actions and on civil disobedience, articles discussing gender, conscientious objection, land grabbing, peace-building and antimilitarist trends in various regions. They reflect discussions we have had in WRI over the last 20 years. “War is a crime against humanity. I am therefore determined not to support any kind of war, and to strive for the removal of all causes of war.” This founding statement of WRI was made just three years after World War One, and is still as much of a challenge as it was when it was written. In this article I would like to look at different dimensions of this challenge. Dimensions which have to do with what kinds of wars we face today, and with challenges that result from the fact that we are not all affected the same way by these wars nor have the same relationship to their causes. “Any kind” - what kind of war? When WRI was founded in 1921, it was with that experience of a war with masses of conscripted soldiers fighting in trenches on the battlefields. Since then the perception and the reality of war have changed. There are many more internal than international wars. Civil wars where people fight for control over territory, fertile ground or herding rights, for self-determination, for secession, for an ideal state (like IS does), for control over resources that can be sold to the international market, or just because it is the only way for the strong to make a living. Many of these conflicts are hardly of a political nature in the narrow sense, though of course in the end everything is political. We speak today of other kinds of war also. We speak of a war of the rich against the poor, of white against black, of war against the environment, war against women and LGBTQ people, war against non-human life, etc. War does not only take place when an army marches against another one (or when a drone directed from a comfortable position thousands of km away is murdering people). War is there wherever violence is used to suppress legitimate interests, or where structural violence dominates. Therefore: Can we still speak of not supporting “any kind” of war if war has become so much more complex than one government declaring war on another? In a certain way, we support war whenever we start up our car, use our mobile phone or pay our income tax. But let us not confuse unwilling support with the lack of resistance. If wars have become much more complex, the ways of resisting them have also multiplied. There is no single, shared and convincing explanation of why there is war. Theories range from biological and psychological explanations, explanations blaming various ideologies and world views (including religions), the Marxists’ theories of exploitation, the feminists’ patriarchy to the capitalist (‘realist’) assumption of ‘greed’ and rational weighing and seeking of maximum advantage. If there is one emerging consensus then it is only that there is not one explanation, but that systems’ theory or comparable approaches which offer multiple, interlinking factors as elements of explanation, and distinguish between root causes, catalysts, triggers etc, are the only ones that help. Abolition of war and military through direct resistance (refusing to serve in the military, strikes, civil disobedience). 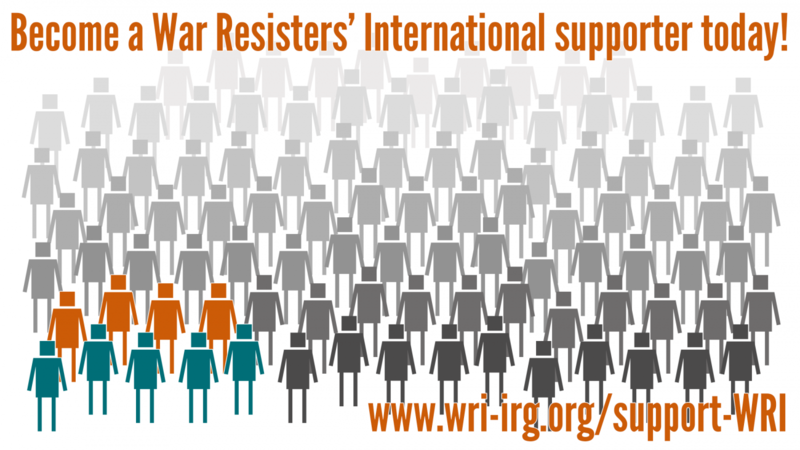 The refusal to participate directly, personally in a war, neither as a soldier nor as a civilian involved in civilian support structures (like civil defence), worker in the arms’ industry, or as a politician making the political decisions for going to war is besides the “no to all wars” the thing that probably distinguishes War Resisters International most from other peace organizations. In this issue, you will find several articles discussing total and conscientious objection, from the Insumisos in Spain to war resistance in Latin America. Striving for the abolition of war and military through replacing it with nonviolent means for purely defensive purposes (civilian-based defence, building of unarmed ‘peace armies’ modelled on Gandhi’s concept of a Shanti Sena, civilian peace-keeping etc.). Tackling the economic side of war: Conversion of arms industry and prohibition of arms trade are topics that are reflected in WRI’s campaign against war profiteering. Overcoming war ‘indirectly’ by radical and comprehensive social change. Alternative concepts of socialism and anarchism would fall inter alia Into this category . Effectively outlawing war by creating a stable and effective framework of international law which functions in the same way as the monopoly of violence has ostensibly helped to reduce violence within states. While such concepts have never played a central role within WRI, many of its members are for example also members of the International Peace Bureau whose main focus is on this approach. Starting with the worst symptoms of violence and war hoping that progress in these fields may create momentum for further disarmament. To this category belong the movements against particular weapons (land mines, nuclear weapons, drones, arms export etc.). Also this approach pacifists share with those who would not go as far as demanding total demilitarization. In this issue, there are several articles highlighting nonviolent actions undertaken against military bases, nuclear weapons etc. WRI brings into these struggles the nonviolence perspective – not only techniques of direct nonviolent action and civil disobedience, but the deep conviction that nonviolent approaches are the better ones because they unite the ends with the means and acknowledge the dignity of everyone, including the political opponent. Work on changing attitudes towards violence – this is what is at the core of peace education and peace-building as they are being practiced in so many places in the South and North. Dealing with trauma in various places, from Burundi to Kosovo, the work affiliates of WRI for example in Africa are doing to overcome wars and violence in their countries. In Cape Town this July we heard for example a lot on how the Quaker’s trainings on “Alternatives to Violence” are applied from Colombia over Sudan to Nepal. “Striving for the removal of all causes of war” however is still more than that – it is not only struggling against the latest threat, the newest military base built somewhere or the most recent “military intervention”. Removing the causes of war also means looking at the structures of exploitation and inequality, at misanthropic and hatred-based ideologies, at how we relate to nature and to all life. Therefore: I believe that all the approaches listed above are needed, and that we should look at what they can serve for rather than criticizing the less radical approaches for what they are not doing. For example: Protesting against nuclear weapons (think of the blockades at the nuclear arms factories in Britain) is sometimes criticized because banning specific weaponry could be seen to serve to legitimise 'less bad' weapons. But on the other hand: Getting rid of this particularly dangerous type of weapon may lead to a revision of military strategy, and create a dynamic where further steps of demilitarization are possible. There cannot be a master plan telling us which steps exactly to take to overcome war. Social change is just too complex, and (fortunately) science has proven hithertoo unable to break its complexity down to create predictive models. But what we know is that complex and radical change is indeed possible. Otherwise there would still be legal slavery, women would nowhere have the right to vote or choose how to live independently of a husband , LGBTQ people would everywhere go to prison or be executed, there would not be such concepts and instruments as peace building or conflict transformation, and nobody would question authoritarian forms of government. This knowledge is what we may want to remember when things once again look especially dark - and then continue to take action, be it organizing protest and civil disobedience against the latest military adventures of NATO or our individual countries (think of Jeju in South Korea), actions against extractive industries and land grabbing in India or Latin America, pressurizing political leaders to come to a peace agreement like in South Sudan, ending the occupation of Palestine and refusing to serve in the Israeli army, joining actions against racism or against the big banks, etc. – the list of activities WRI’s affiliates are involved in is far too long to do it justice here.